I had a much better time at Fashion Week yesterday. I don't know if it was me or it. Most likely me. I stopped trying to make Fashion Week into something it isn't. Instead, I embraced it for the big dumb spectacle it is, zigzagging across Manhattan on the subway for Public School, Derek Lam, HBA, and Thakoon, taking rapid-fire shots of street style stars (Anna Della Russo, Irene Kim, Shea Marie) as they scuffled between shows, dodging traffic on 7th Ave to get shots of kids with tattooed faces doing tricks on skateboards. Of course it helped that the shows were ones with an aesthetic that more matches my own. I dig the gender-fluid hip hop brashness of Hood By Air, the streetwear sleek of Public School. And the people who attend these shows (some of them at least) are more like the people I might shoot on the streets of Philly. They still have some edge. They still have some grit. They still feel like they're on the margins of the industry, even if it's a margin manufactured for marketing purposes. 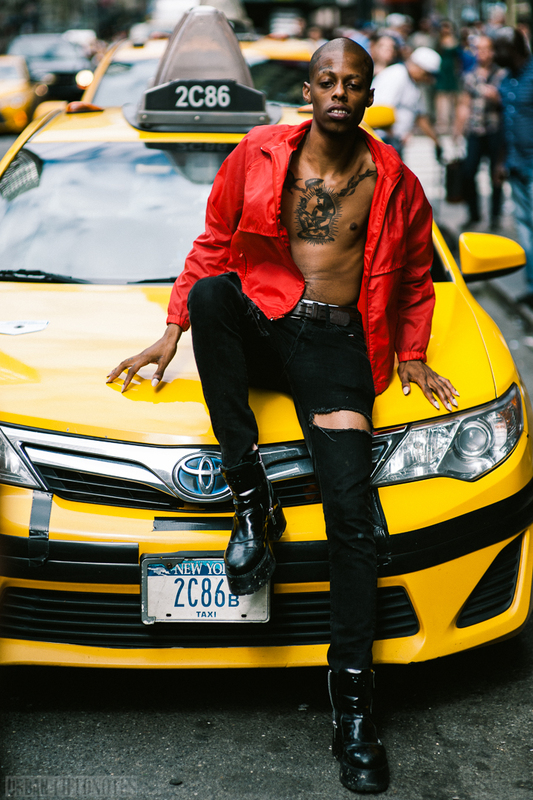 I need a dose of the street in my street style, yellow cabs included.